Pokemon Quest has a big problem: It's hella boring. Pokémon Quest is a free-to-play action game for Nintendo Switch and mobile. It came to the Nintendo Switch on May 30, and then to mobile on June 27. It's quite popular, and I'm wondering if that popularity will last much longer. 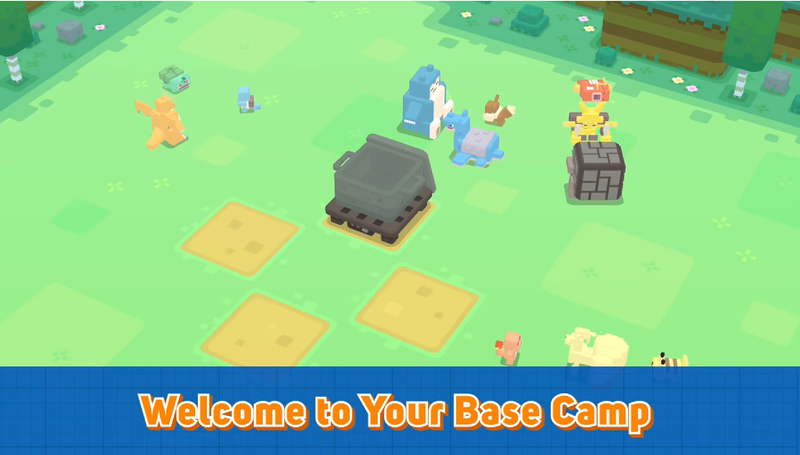 In Pokémon Quest, you explore an island full of Pokémon region-by-region. Your assembled team of three tamed Pokémon get their claws dirty against wild Pokémon while you mostly sit back and watch. Instead of capturing the wild Pokémon whose health you whittle down, you brew up stews at your campsite that send the little critters running to your side. While you can customize your Pokémon to a degree by equipping them with chips that increase their power and health, Pokémon Quest is very hands-off. My interest in the game quickly depleted and I stopped playing regularly. Pokemon Quests' Pokemon come with sharp edges, so get a tetanus shot before handling them. Does that mean Pokémon Quest is doomed to become a flash-in-the-pan that might stay afloat a month or two longer thanks to its Pokémon name? I don't think so. Pokémon Quest isn't bad; it's just boring. "Bad" isn't easy to fix, but The Pokémon Company can probably reverse "boring." The longevity of Pokémon Go is a good example: After the app's red-hot debut cooled down, a sizeable portion of its player base got bored with simply lobbing PokéBalls at the same Pidgeys and Rattatas while standing in the shadows of unconquerable Gyms guarded by four 2700 CP Dragonites and two 3000 CP Snorlaxes. The Pokémon Go experience has since been overhauled in a big way, and its player base is stronger than ever as a result. I don’t even think Pokémon Quest has to be overhauled as drastically as Pokémon Go to maintain players' interest, either. While the game boasts simple controls (not a lie: You simply tap on your Pokémon's attack icon when it's filled, and you can perform easy dodges), the downside is they turn the action into a real snoozefest. Fighting other Pokémon is necessary in Quest, because it's how you progress the story and acquire chips that strengthen your team, but I never feel excited when I hop into the fray with my troops. I press "Auto," put my phone down for a few minutes, and come out smelling like a rose nine times out of ten. Oh no whatever will I do oh look at that I won. Hourrah! Going on expeditions is also how you pass time and allow for your Pokémon stews to cook. The art of stew-cooking is a little mysterious (good thing we have a Pokémon Quest recipe guide to help you out), so if your fire-heavy team needs a Grass-type to help in an area populated by Rock-types, you have to go through some batches of stew first. That means going on more expeditions. And that means more sitting idly by while your Pokémon tear up their wild kin. I feel like expeditions can stand to be a lot shorter. Alternatively, give me a good reason for paying attention to the action on-screen. Make Pokémon bosses tricky; don't just turn them into HP sponges. Make recipes less vague so I have a better chance at attracting the Pokémon I need to finish expeditions. Heck, make recipes deliver on their promises more often, if not 100% of the time: I've had blue stews attract herds of Ponyta instead of the vital water-types I desperately needed at the time. That's a big waste of time and resources, and a big reason why I ultimately turned off the game and said, "All right. Screw it." This stew is for Fire-type Pokemon only. Hey! Lapras! Get your slimy Water-type snoot out of my chow! Ugh, fine. You can stay. 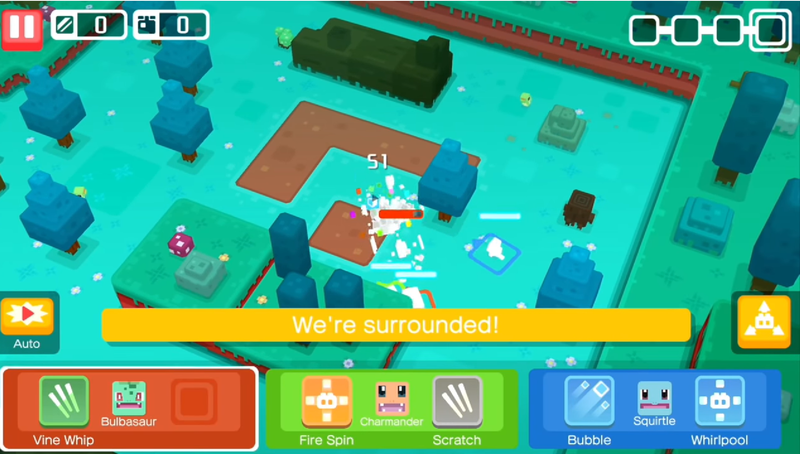 I'm an apologist for free-to-play Pokémon romps on mobile—I'm a Go fan, obviously, but the cleverly-written Magikarp Jump was probably my favorite mobile game last year—so I'd like too see Pokémon Quest stick around for a while. Hopefully The Pokémon Company is prepared to put in the work necessary to keep the game engaging. Ideally, we'd see constant updates and events like we see with Pokémon Go. I do love the sight of the cubed Pokémon tumbling around and playing with each other, and I like seeing who visits my camp whenever it's meal time. There's no denying Pokémon Quest is earnest and wants to at least try and show its players a good time. I think it can pull that off. 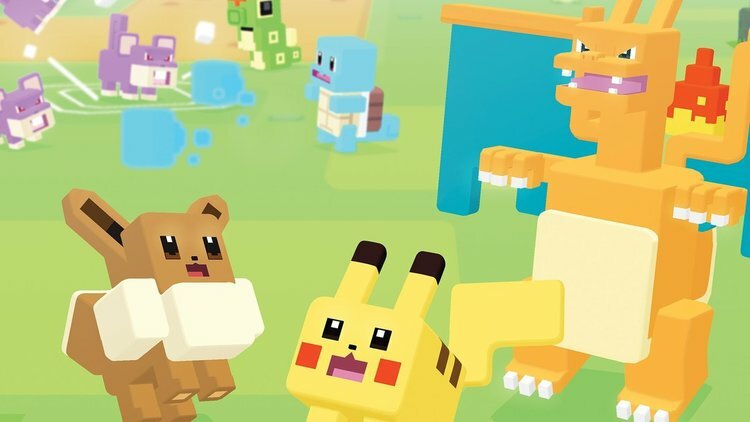 And, despite being a free-to-play game, Pokémon Quest isn't nearly as much of a cynical cash-grab as another free-to-play game based off a popular kids' property. So, there's that. Tagged with Game Freak,	Niantic,	Opinions,	Pokemon Quest.